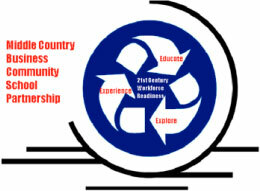 The Middle Country Business Advisory Board is a combined effort of the Middle Country Central School District and the Greater Middle Country Chamber of Commerce. Now in its 7th year, we are again seeking local businesses interested in mentoring students through our Career Exploration Challenge Program. We need business leaders who will allow students to shadow them for 10 hours. Students are required to make presentations at the conclusion of the program. These presentations are judged by a committee and are awarded small scholarship amounts based on the committee selections. Funding for these awards is through community support. The Middle Country School Business Advisory Board supports the mission of the MCCSD and links our schools with the business community surrounding us through exploration, education and experiences. Emphasis will be on the skills, knowledge, abilities and opportunities needed to prepare today’s students for the 21st century workforce. To learn more about mentorship opportunities, please give us some details about your business and a representative will be in touch. Become a Career Exploration Challenge Sponsor!